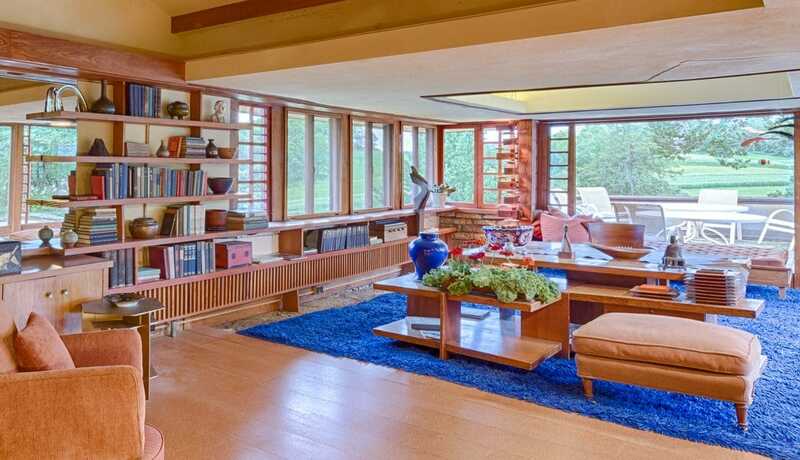 Explore the celebrated interiors of some of Frank Lloyd Wright’s renowned works. The year 2017 marked the 150th birthday of iconic architect Frank Lloyd Wright, and his provocative, modernizing designs live on in perpetuity with ever-increasing allure. While the exteriors of many his buildings are well known, here we look at the interiors of seven famous Wright-designed structures. The architect’s winter home, nestled in the arid foothills of Arizona’s McDowell Mountains, is now today the home of the Frank Lloyd Wright Foundation and the School of Architecture at Taliesin. At the core, this home is connected to the desert from which it rises—vaulting ceilings crafted of wood and glass rise to the sky, and stone punctuates the modern space, even as an elemental material for walls and ceilings. Explore Wright’s desert laboratory in person with one of the many docent-led tours available. Unveiled in 1910, this home designed for Frederick C. Robie is the ultimate—and most innovative—example of Wright’s Prairie style. The living-dining space—a narrow, but long room, separated by a freestanding fireplace—is celebrated as one of the great masterpieces of 20thcentury architecture. The exterior wall, essentially made up of glass doors opening out to the patio and beyond, breaks down the boundaries of the interior and exterior and fills the space with natural light. See this century-old home up close—buy tour tickets here. Constructed in 1936 atop a gushing waterfall, this vacation home built in southwestern Pennsylvania for a prominent Pittsburgh couple, is considered Wright’s crowning achievement of organic architecture. Glass walls open to the landscape, the first-floor living and dining room merge as one open space from which a hatch door opens to a suspended stairway that descends to the stream below. Experience Wright’s organic architecture at Fallingwater. Take a tour. Seen by many as Wright’s masterpiece, the Guggenheim Museum building opened for business in 1959 as a structure “having monumental dignity and great beauty,” as the architect described it. The interior is an organic, spiral, orderly display of levels winding to a massive domed skylight. Discover world-class art and architecture with a visit to the Guggenheim. Wright built the Prairie-inspired home on his sprawling, 800-acre agricultural estate in the hills of the Wisconsin River valley where his Welsh grandparents homesteaded the land. In this expansive laboratory for his organic architecture, the Taliesin home is a study in wood and stone that opens to the outdoors with Wright’s signature use of glass and light. Learn more about Wright and Taliesin by taking a tour. Wright’s last major commission—and his only government building—this structure built in Northern California in 1957 boasts a highly modern, stark, curved interior along with the architect’s signature link between the indoors and outdoors. Plus, a new app from the Marin County Department of Cultural Services offers up indoor and outdoor drone footage, blueprints, and photographs. The 90-minute docent-led tours of the Civic Center are offered every Wednesday and Friday at 10:30 am—learn more here. Challenged by Herbert Jacobs in Depression-stricken 1936 to create a “decent home for $5,000,” Wright delivered a structure that spawned his Usonia affordable architecture movement. Located near Madison, Wisconsin, this structure complemented the natural landscape, embracing wood, stone, baked clay bricks, clerestories, and glass curtain walls. Explore the house that birthed a movement—learn more about visits here. Italian luxury brand ISAIA opened its first San Francisco boutique in Frank Lloyd Wright’s V.C. Morris Gift Shop (1948).